Mothering magazine is offering my readers a giveaway of a free one-year subscription! Before anyone internationally feels left out thinking about a digital subscription, let me say that I have a digital subscription, and I love it! (Click here for a free sample of the digital interface, and read more below.) The best part? Because this giveaway ends so close to the holidays, a digital subscription could be a perfect Christmas gift with immediate shipping! If there's a new parent you know who could use encouragement, this subscription could be just the right thing. If you're a current Mothering subscriber, you can extend your subscription by a year, or you could choose to give your prize subscription as a gift to someone special. Either subscription is for one year, which is six issues total. That's six issues of information, advice, and inspiration. It's like having a knowledgeable and loving big sibling talk you through parenting. Plus, it's visually such a gorgeous magazine. The cover images of adorable tots always make me smile, and even the ads inside are appealing, because they're for products and companies you would support, too. After receiving the print subscription for several years, I decided to switch to the digital version with my latest renewal, and I've been very happy with it. All of the aspects of the print version are included in the digital: front cover, table of contents, ads, letters to the editor, everything. It's an exact digital replica of the print magazine. To browse through a sample digital issue and test out the interface, click here. You can zoom onto each page to view at reading size, or stay zoomed out to browse. Links within the text are hyperlinked so you can click to go immediately to the referenced websites. Only a standard internet connection and browser are needed to view the digital subscription, no software to download. I haven't had any problems with loading or lag times. You can see the contents and pages at a glance along the left side so you can quickly find the article you want. It's easy to subscribe to Mothering online at Mothering.com. You can also find print issues for sale on newsstands at select brick-and-mortar locations, notably natural foods stores such as Whole Foods, major bookstore chains like Borders and Barnes & Noble, and Babies R Us. Back issues are on sale online for 50% off for a limited time. There's also an audio version. Mothering also has published inspirational and informative books, such as Having a Baby, Naturally: The Mothering Magazine Guide to Pregnancy and Childbirth and Natural Family Living: The Mothering Magazine Guide to Parenting . Print subscriptions start at $22.95 (U.S.) for one year to the United States. Canadian and other international subscribers add $13 per year. Print subscriptions typically enter you into giveaways and can often include free gifts as well. If you sign up for the newsletter, you'll receive advance notice of any deals connected with subscribing. MAIN ENTRY: Visit Mothering.com and tell me an article that looks interesting to you! Tell me whether you'd want the print or digital subscription. Tell me if you've had a subscription before. Tell me what you like best about the digital version. Disclosure: I paid for my own Mothering subscriptions. Since we'll be traveling by plane twice in the next year, this article will be a lifesaver for me - http://mothering.com/parenting/travel-tips-for-flying-with-your-children. This looks like an AWESOME magazine! I would love a print copy - I like having something tangible that I can page through, especially on long car drives. I subscribed to Mothering.com's newsletter. I like Mothering Magazine on Facebook. I found a new recipe! Gluten-Free Bundt Cake with Apricot-Orange Glaze. So perfect, it covers all the dietary restrictions from my Mom group! I have never had subscription, even though I have asked for one since the first one I picked up and didn't feel so alone any more! That was before awesome blogs. I love the search feature in the digital version, to quickly get to what I want to read about then. I follow hobomamareviews.com on Google Reader. I follow hobomama.com in Google Reader. I follow Natural Parent Network on Google Reader. I follow Hobo_Mama on Twitter as RealMommy. I follow @NatParNet as RealMommy. I like Mothering Mag on Facebook. Though I like the digital copy, I would prefer the print copy so it is easy for me to access any time! Mothering is what started me on the road to AP. I'd like the digital version, for the green aspects of it. Oops, already answered another of the entries. :) I like that the digital version doesn't kill trees. I follow @MotheringMag on Twitter. I'm @growwithgraces. The "Let the Baby Decide" article looks good. I felt like that when I was pregnant. When my son was ready he would come out. The article is a case against inducement. I would love a digital subscription! I have never subscribed but I've always wanted to!! What I like about the digital version is that it won't add to my already-cluttered house!! I subscribed to the All Mothering.com Feeds via google reader. I subscribed to HMR via RSS Google Reader! I follow MotheringMag on Twitter!! The "Close Your Eyes, Listen to the Skies" article sounds great. I'm always on the lookout for eco-friendly and safe-for-kids toys that I won't feel guilty about. i love their articles about extended nursing.. definitely soak in all the info from ALL the articles! "they saw it all"! It relates very much to me right now, with the upcoming addition to our family. I liked mothering magazine on FB! I love the articles about cloth diapering. I would want the print subscription so I could read it while on my lunch break. I have never had a subscription but I would love one! I like the search feature in the digital version because it will help me find something quick instead of just looking and looking myself. I absolutely love Mothering magazine! I would love to receive a print subscription. I have had a subscription to Mothering before and LOVED every page of it! I follow Hobo Mama on Facebook. I "like" Mothering magazine on Facebook. I "like"the Natural Parents Network on Facebook. I am re-posting the giveaway information on my Facebook page. I receive the Mothering newsletter. I love Mothering Magazine! Thank you for the opportunity to win! If I won I'd want the print subscription...my treat to myself is to wait until my son was asleep, then snuggle up on the couch w/ the new issue and a cup of tea! I already subsrcibe to the Mothering.com newsletter. (And I forgot to state what article looks interesting to me in my Main Entry -- sorry about the oversight! How could I pick just one? I'm interested in reading "They Saw it All" because I'm expecting our second child in March. "The Magic of Christmas" sounds like an insightful read, because now that our son is 2 1/2 we're wondering how to approach the whole Santa-thing, and I'm eager to read "It's a Gift" because I've caught the crafting bug and have been having such fun creating! I already subscribe to Mothering.vom's RSS feed. I am interested in the article "Lessons in Public Breastfeeding". I would want the print subscription. I have been a Mothering subscriber for a year, and would use this to renew my subscription! I already like Mothering on Facebook. I am subscribed to the Mothering email newsletter. I entered to win the amber necklace. I would enjoy the print version, because it's more comfortable for me (but if I had a laptop computer I wouldn't mind the digital!). I've never had a subscription to Mothering before, but would love to try it out, the articles look great! I browsed through the Digital sample issue, and was very impressed with the clear format and easy-to-read set up, it's great! Wow! I love this magazine. One article on the site that looks interesting to read - "The Magic of Christmas"
I did have a subscription once, it was a gift. The articles in the magazine are so touching and informative! Thanks for the opportunity to win, outside of the US. I liked Mothering Magazine on Facebook. 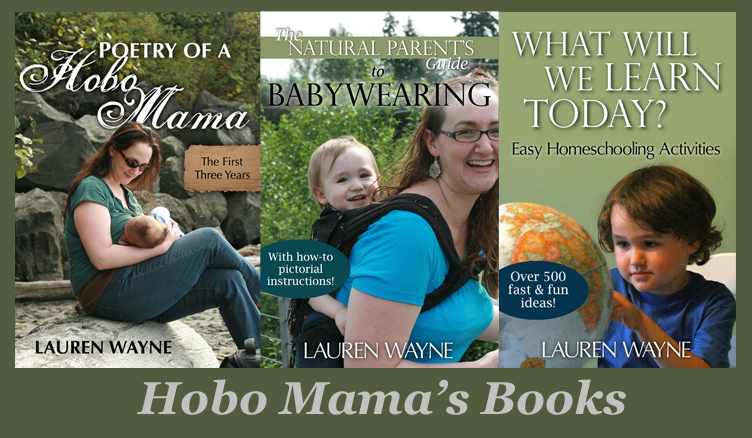 I liked Hobo Mama on Facebook. I like print subscriptions because I like to keep mags around for collage projects. I just officially followed you through google friend connect... It's nice to make things official! I just signed up for the Mothering.com newsletter! I would love the digital magazine! I have not had a subscription before. Digital magazine - going green! Just checked out http://mothering.com/parenting/the-magic-of-christmas because it was perfect for what I have been thinking and writing about in regards to my own family. I would actually like the print because I have more time to read it. I have never bought a subscription before, but have always wanted to! I'm pregnant (due around the same time as you, I think) so "How Childbirth Went Industrial: A Deconstruction" looks interesting to me. I don't know if I fully understand how the mothering.com website works. I noticed some of your other readers left comments about being interested in reading old articles, but I'm having a hard time finding past articles on mothering.com. I read an old issue from the library that had an article on breastfeeding and PPD. I really wanted to share the article on facebook, but I can't find it on mothering.com... any advice? I'd like the print version. The only time I ever have to read is in the bath or in line at the store, so the digital version wouldn't really work for me. I haven't ever had a subscription. I've always just checked out the magazine at the library or gotten old copies from friends. I subscribed to the mothering.com newsletter. I can't believe I didn't realize they had one before now!